The Adamic covenant or contract was made between God and the first man, Adam and by extension, between God and mankind. Since God will not, and cannot lie and remain as God, then God will not and cannot breach a covenant or contract and remain as God. Therefore, it is only man that acts in bad faith by lying, breaking and breaching covenants. The Adamic covenant was a mutual good faith contract that some refer to as the Edenic covenant while others try to separate the two. There were in fact, multiple covenants or contracts established between Adam and God in the form of agreements, promises, proclamations and pronouncements and statements of fact. These contracts were made both before and after what is referred to as the fall of Adam. God said, referring to Adam and mankind, I will make you in My image and My likeness, you shall have dominion over all creation, you will subdue all creation, you will replenish the earth, you will have dominion over all the fish, fowl and everything that moves and you and I will have regular fellowship in the cool of the day. God continued, saying, replenish in order, not in chaos, be fruitful and multiply in all things, subdue, lead the Kingdom, exercise dominion, rule as king and protect everything you are responsible for. It may surprise many to hear that Adam, the patriarch, was still alive up until Lamech, the father of Noah, was around 55 years old. And that Seth, Adam’s son who inherited the patriarchy, was still alive when Noah was born and died during Noah’s lifetime. I believe that Adam and Seth held everything together by teaching the generations after them what they had learned from the Lord, including the importance of operating in good faith. But when Seth died, this teaching evidently died with him and was no longer taught nor enforced. I believe that it was in the days of Noah, during his lifetime, the five-hundred year period just prior to the flood, that the concept of good faith broke down to the point that it became “every man for himself” with no means of mutual agreement, trust or relationship, resulting in continual warfare and strife. By the time God asked Noah to build the Ark, the application of good faith had completely broken down, resulting in God’s decision to start over with Noah. Why is this important? Because Matthew 24:37 says that when Jesus returns, the world will be just as it was in the days of Noah and I believe that we are now seeing evidence all around us of that same rapid breakdown of good faith. The Noahic covenant or contract promised that never again would a flood wipe out the earth’s population. It reestablished the agreement to rule and replenish – in order not to have chaos, and reestablished dominion over all creation, including fish, fowl, and everything that moved. But added that whereas only fruits and herbs were to be eaten prior to the flood, now and in the future everything that moved could be eaten as food. And the rainbow was the seal of this covenant. Secular history, legend and mythology paint a collective picture of the patriarch Noah taking his covenant with God very seriously by ruling his extended family throughout the regions of the Mediterranean and Black Seas from his headquarters near what is now Rome Italy, through a hierarchy of tribal chiefs, kings and a priesthood headed by his son Shem. Even though God reestablished good faith with Noah and his sons after the flood, it seems not to have been fully implemented until God reintroduced it to Abraham some ten generations later. When God made His promises to Abraham or at that time Abram, He backed it to the hilt, putting His own name, reputation and Godhead on the line saying, if I say, “Blessings!” then most assuredly I will bless thee, and if I say, “Increase by multiplication!” then most assuredly I will increase everything you have by multiplication and after Abraham had patiently waited, he did obtain the promise (Hebrews 6:13-15 TGV). You’re just foolish if you don’t acknowledge all of the legal evidence that Jesus Christ was executed by crucifixion, just because some among you say something different. Did you receive the Holy Spirit by an act of legislation or in good faith? Were you made whole again physically, mentally, emotionally, financially, or socially through what you can detect through your own five senses? The one that administered the Holy Spirit to you and operated in the supernatural among you, did he do it by an act of legislation or just offer it to you in good faith? 1. They, which are of good faith, are children or followers of His example. 2. The written record, foreseeing that the Lord would make provision for the non-Hebrews to have this same personal relationship and access through good faith articulated this good news, even back then to Abraham. He said, because of you, Abraham, all nations will now have the opportunity to be blessed. 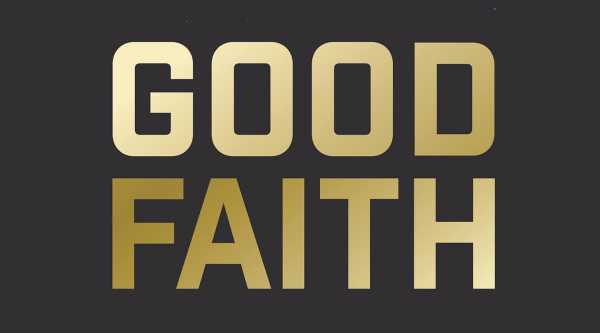 Therefore, all whom are practitioners of good faith, even to this day, are blessed through Abraham’s good faith. Through you, Abraham, all nations shall be blessed (Galatians 3:1-6 TGV). In part 2, we will explore the life of Abraham and shine some light on his background to more appreciate what he left behind and the magnitude of his utter dependence upon his good faith contract with the Lord.